The doubters seem to take pleasure in saying what can’t be done. But we don’t do this to make them unhappy. We do it because making the very finest possible things is part of what we are. It is a standard we set for ourselves, not for those who sit by, content in their mediocrity. We’ve always known this path would not be easy. But our commitment to unsurpassed quality and American-made luxury has never waned. So while the easy path has always beckoned, we have chosen to never compromise. We know that our belief matches yours—that a thing worth doing is worth doing right. Chicago's Horween tannery, founded in 1905, supplies the leather for The Prairie. The Latigo leather is chrome-tanned with a vegetable overtan. Chrome-tanning allows for water resistance, a quality not found in a pure vegetable tan. Accordingly, the leather was chosen to provide both function and beauty. The patented handle is constructed by a fourth-generation harness-maker. It takes three days to cut and stitch, and it is burnished by hand with burnishing solution and beeswax. The handle on Fischer Voyage bags is ergonomically designed, allowing the hand to easily wrap around the handle, and features a shape that provides subtle distinction. The tab is constructed of Latigo leather on the outside, and the underside is horsehide. The combination of the two provides greater strength. On the underside of the tab, the owner may find a logo indicating the bag is an authentic Fischer Voyage. There was no off-the-shelf hardware available for the function of the bag, so all of it had to be designed and tested. The brass hardware is machined entirely by hand from 360 brass stock. The frame is constructed of bent stainless steel, and carefully shaped to allow the bag to close precisely at all points. The striker plate is of solid machined brass, for both strength and aesthetics purposes. The bag is lined with an American-made woolen felt that is rated for 40,000 rubs – and is anticipated to last many generations. In order to provide the strongest construction possible, Fischer Voyage products are stitched by hand using a waxed polyester thread from Maine, providing greater strength and longevity than a machine stitch. Most suppliers presented thin, pre-cast buckles made overseas. 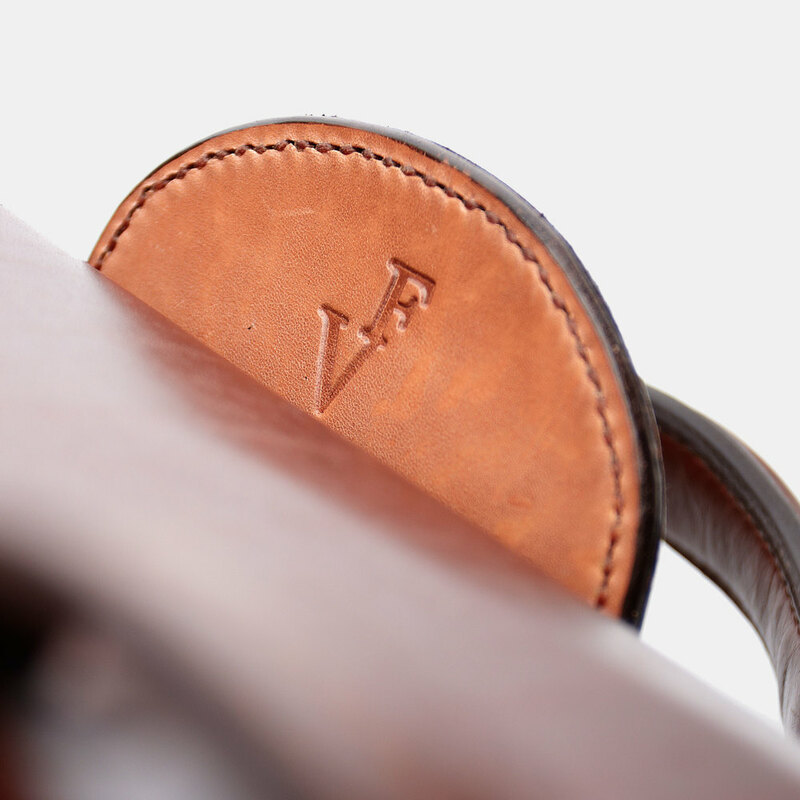 The buckles featured on Fischer Voyage products are forged by a blacksmith, who communicates via posted letter. 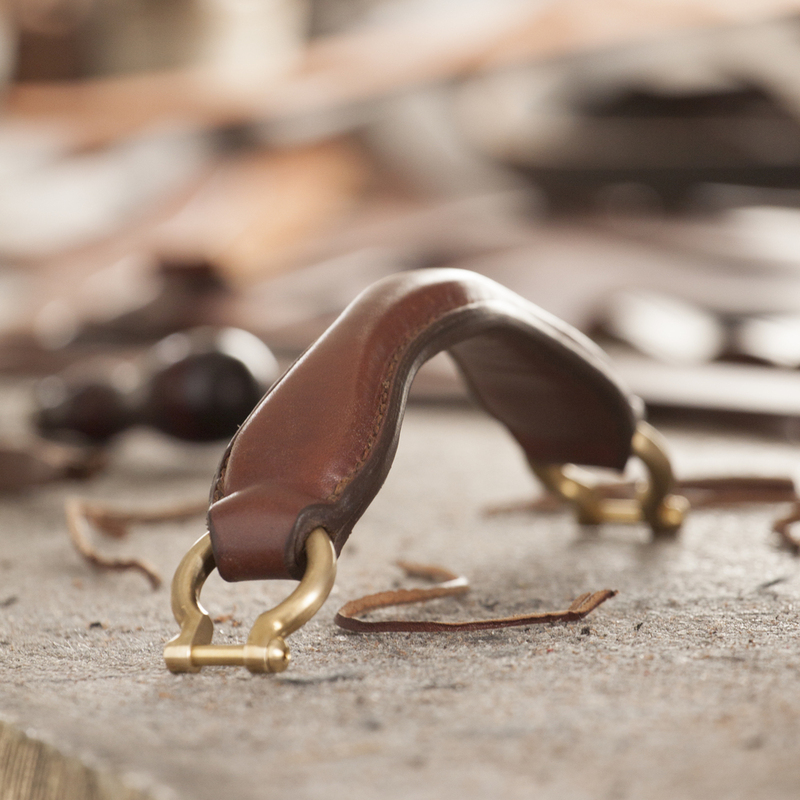 They are solid brass, in the tradition of fine harness hardware. The studs are each turned on a lathe, and they are pronounced enough in size to provide protection from the elements below the bag. When the bag is placed on the ground, the five brass bottom studs provide a solid “clank” sound.